Electro magnets are engineered for use in high volume and deep burden applications. Their primary advantages are their "deep reach" and the ability to be turned on and off. Mounted over a vibratory bed or belt conveyor, these magnets set the industry standard for strength. 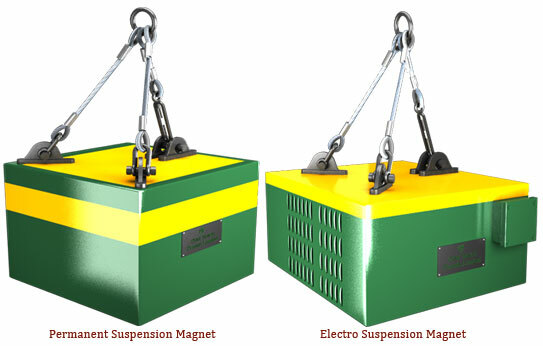 Electro Suspension Magnet consisting of aluminum or copper wound coils immersed in a transformer oil (for prevention of overheating or shorting) or air-cooled for extreme or dusty environments.All electro suspension magnet comes along with control panel. Operating height of Suspension Magnet range from 150 mm to 450 mm are available. Manually cleaned magnets can be supplied with a stripper mechanism. No power consumption, virtually maintenance free. The ERBM Series magnet is a powerful oil-cooled electromagnetic plate magnet, suspended over the conveyed product stream. The Suspension Magnet should be located in an area on the production line that allows easy access for proper maintenance of the magnet and it should be operated in an area where no integral parts of the conveying system can become magnetized; such as idler rollers, pulleys or belt support plates. Manual Clean (MC) Suspension Magnet must be periodically turned off in order to discharge iron accumulated on the face of the magnet. Suspension Magnets are suitable for applications where only occasional tramp iron is expected. These magnets are usually suspended from a travelling trolley so that they can be swung clear of the conveyor before the iron is released. Self-Clean (SC) Suspended Electromagnets or Suspension Magnet provide continuous, automatic removal of tramp iron and feature a heavy-duty belt, a channel frame for supporting the pulleys, adjustable belt take-up and drive. Suspension Magnet are recommended where a large amount of tramp iron is expected or where there may be limited access to the magnet for cleaning purposes. Suspension Magnet are rugged-all-welded construction & can efficiently prevent the coil from erosion of moisture, dust and harmful gas. Good environment and climate suitability, safe and reliable in operation and convenient maintenance. The magnetic circuit of the Suspension Magnet is designed in optimization with deeper permeability,and its geometrical figure in the space magnetic field shaped semi-sphere so that will produce much stronger magnetic force compared with the other wares. The Suspension Magnet has Field winding coil treated by vacuum desiccation and filled with special packing material to improve its mechanical and electrical performances and keep a long service life. Suspension Magnets are Easy to form a complete set with other equipments to meet the different requirements under all kinds of circumstances.The relevant commutating equipments have complete functions available. Star Trace Suspended Permanent Magnet Separator are designed for high separation performance in over-the- belt conveyor applications. These heavy duty permanent Suspension Magnets incorporate all welded construction are particularly effective in removing tramp metal in high volume applications. Produces strong magnetic field attraction. The Suspension Magnet separator body adopts rare earth permanent magnetic materials featuring high remanence, high coercivity and high energy as magnetic source. The property is persistent with high temperature stability. The steel for Suspension Magnet is chosen from the national famous material enterprise (national inspection-exempted product) with high purity material and advanced manufacturing process to ensure the property will not be affected by ambient temperature and mechanical vibration. The material is electroplated on the surface, and assembled with particular clamp by special man, to minimize the difference and make strict anticorrosion treatment. This series links up with transportation equipments such as all types of belt conveyers, vibration conveyers and charging pipelines to form a complete set to remove the iron materials under weight of 0.1~0.5kg mixed among the non-magnetic materials to ensure normal & safe operation of the next-step equipment (such as muller, crusher, etc.). Star Trace Pvt. Ltd. is a prominent manufacturers and supplier of suspension / suspended magnets , electromagnetic suspended Magnets , magnetic suspension system and magnetic suspended magnets used in various industrial applications. We are manufacturers, suppliers and exporters of a wide galore of industrial equipments such as suspended Magnet, Electromagnetic magnet, suspension magnets and so on.We are Specialized manufacturers in fabrication of this equipment for 25 years and this enables us to be a leader in this field.we are manufacturers, suppliers and exporters having an iso 9001 2008 company and listed in D & B for confidence. our aim is to remove iron particles in process line to protect costly machinery and purify the process line for conveyors applications.we manufacturers to provide combination of several equipments to archive this mission for conveyors applications. Star Trace manufacturers of electromagnetic suspension Magnets consists of aluminum or copper wound coils immersed in a transformer oil (for prevention of overheating or shorting) or air-cooled for extreme or dusty environments.All electromagnetic suspension magnet comes along with control panel. Suspension Magnets are engineered for use in high volume and deep burden applications. Their primary advantages are their "deep reach" and the ability to be turned on and off. Mounted over a vibratory bed or belt conveyor, these suspended Electromagnetic magnet manufacturers set the industry standard for strength.